Thanhouser Career Synopsis: Frank H. Crane was one of Thanhouser's most important actors, later a director, from the inception of the firm until he departed in 1911. Biographical Notes: Frank Hayes Crane was born in San Francisco in 1873. 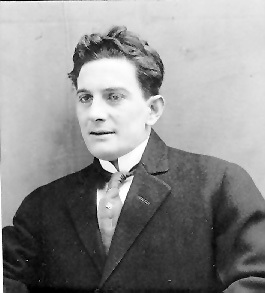 He was with Edwin Thanhouser in 1909 when the film company was being set up, and he had the adult male lead in Thanhouser's first public release, The Actor's Children (March 15, 1910). For the next year he was Thanhouser's leading man (Violet Heming was the leading woman at the time) and was featured in numerous productions. At the time his home address was 8 Centre Avenue, New Rochelle. Early in the summer of 1911 he directed films for Thanhouser, leaving thereafter for a short stint at Lubin (where he played in Al Martin's Game, The Senorita's Conquest, etc.). In autumn 1911 trade publications announced that he had joined as head director the Comet Company, a reorganization of the former Yankee firm. His stay there was brief, and by January 1912 he had departed and was at liberty. In November and December 1912 it was reported that he was near Montreal with a Canadian picture company and was keeping in contact with his friends at Thanhouser in the warmer clime of New Rochelle. In his column in the New York Morning Telegraph, November 24, 1912, Gordon Trent noted: "Frank Crane, who was the very first Thanhouser leading man, sends me a line from Montreal, Quebec, Canada, where Frank is fast becoming a regular Canuck. He says he is there for a Canadian picture concern and directing. I wish him luck. Montreal is a long ways from Manhattan and New Rochelle, so I trust Crane does so well he will forget where he is located." For a time in 1913 Crane was an actor with American Biograph, and in the same year he was a director for the IMP brand at Universal. The Moving Picture World, April 11, 1914, told of his directing methods: "Every director, according to his own ideas and training, has his own methods of directing. But it is a noticeable fact that a great majority of them are noisy in giving directions to players, particularly when in the midst of a big scene. Director Frank Crane, turning out IMP features, however, is an apostle of the soft pedal' school. "I was born in the West, raised on a farm and owned a ranch of my own,' says Frank, and my experience in handling farm animals has guided my handling of players. Yelling at a horse when he hesitates at jumping a stream or climbing a ridge always makes him nervous, unsure of himself and often balky. Experience has taught me that the same thing applies to an actor. Yell and rave at him when a difficult piece of work has to be done and he is apt to go to pieces and make a mess of it. Just reassure your player with a soft word of encouragement and results are most satisfactory when the work is shown on the screen.'" On October 12, 1914, he joined the World Film Corporation in Fort Lee, New Jersey. In 1916 he directed The Life Mask (Petrova Pictures for First National) Paying the Price (World, July 1916), and The Man Who Stood Still (Paragon for World). In September 1916, having completed his Paragon contract, he advertised in the trade publications that he was at liberty. In early 1917 he was with Balboa in Long Beach, California and had directed The Twisted Thread. Frank H. Crane played in the 20-part Universal serial, Liberty - A Daughter of the U.S.A. He was seen in the 1917 release of The Marionettes (Broadway Star), wrote the scenario for and possibly directed the 1917 World film, The Stolen Voice, directed the 1917 Astra film, Stranded in Arcady, directed and appeared in the 1917 Goldwyn film, Thais, directed the 1918 Astra film, Vengeance is Mine, appeared in the 1918 film, The Street of Seven Stars (DeLuxe Pictures for Sherry Service), directed the 1918 World film, Neighbors, and directed the 1919 World films, His Father's Wife, The Praise Agent, The Scar, and The Unveiling Hand. Frank H. Crane remained in films through the late 1930s, and died on August 31, 1948 in Hollywood, California.